[Ed Note - CM1] originally posted on 2010-04-05 15:55:33 -0400. Bumping because it is a hugely important issue. Before the conference began, Assange described this as a "very rich story." He opened with a brief statement and then showed the video tape. 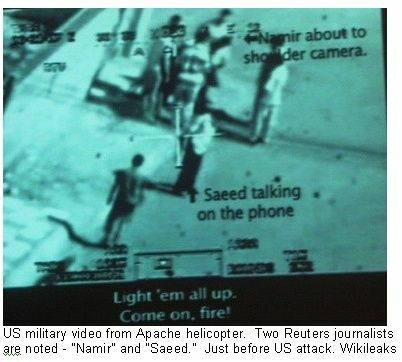 Read more about Michael Collins Reports from WikiLeaks Press Conference - "Collateral Murder, Baghdad July 12, 2007"
a while if you sign up today) and was poking around in their Beta version. I can also say that it is on the road to becoming everything they said it would be, and then some. It is good for messaging, sharing a video, images or to share any bits or pieces of info you might find out there on the net. And everyone or anyone you share it with can add to whatever you post, easily, if you want them to. audio streams can now be inserted into any Wave. conference sessions and by leaving audio messages. 6Rounds - Want to talk abouit a video you want to use and how to use it in a post or how to edit material from one to use in a certain post? Yeah... I know, it looks like a typical flirt place BUT, I also know some video Bloggers that will enjoy and recognize the functionality of this in Google Wave for VBlogging. There is a lot of other stuff that you will like. This seems to be the most functional tool for political Blogging (for any kind of Blogging) I have seen in years. In fact, I can't think of any business that will not see some kind of use for it. And the sooner you sign up for it the sooner you will see what I mean. http://playingforchange.com - Playing For Change: Peace Through Music is a film that explores our connections in a world overwhelmed with division. Through the process of making this film we travel. Hat tip to Luaptifer for calling my attention to this video. Read more about Don't Let This Be YOU! Ilona Meagher has just posted on her blog site, PTSD Combat: Winning the War Within, an outstanding collection of links and a few video's on what the subject title describes "Art For, By And About Veterans Begins Sunday" and the link just above will take you to it. People in the United States of America have been "asleep at the wheel" while their airwaves, traditional media, education and political discourse have been perpetually "dumbed down" to the point where the average citizen is often unaware and indifferent of major people, places and events of the world and from history. Bumped. Originally posted Fri, 02/08/2008 - 22:49. Jane Akre and her husband Steve Wilson are former employees of Fox owned-and-operated station WTVT in Tampa, Florida. In 1997, they were fired from the station after refusing to include knowingly false information in their report concerning the Monsanto Corporation's production of RBGH, a drug designed to make cows produce more milk than what is natural. Side effects of the drug include a 25% greater chance of mastitis (infection of the udders). They successfully sued under Florida's whistle blower law and were awarded a US $425,000 settlement by jury decision. However, Fox appealed to an appellate court and won, after the court declared that the FCC policy against falsification that Fox violated was just a policy and not a "law, rule, or regulation", and so the whistle blower law did not apply. By 10:31 p.m. when the station buried the story in the late news, the report was that WTVT was "completely vindicated." A FOX attorney from Los Angeles was seen telling viewers the jury's decision "does not have to do with distortion of the news." After a five-week trial and six hours of deliberation which ended August 18, 2000, a Florida state court jury unanimously determined that Fox "acted intentionally and deliberately to falsify or distort the plaintiffs' news reporting on BGH." In that decision, the jury also found that Jane's threat to blow the whistle on Fox's misconduct to the FCC was the sole reason for the termination... and the jury awarded $425,000 in damages which makes her eligible to apply for reimbursement for all court costs, expenses and legal fees.